Licensed under patents of Khyber Technologies Corp. 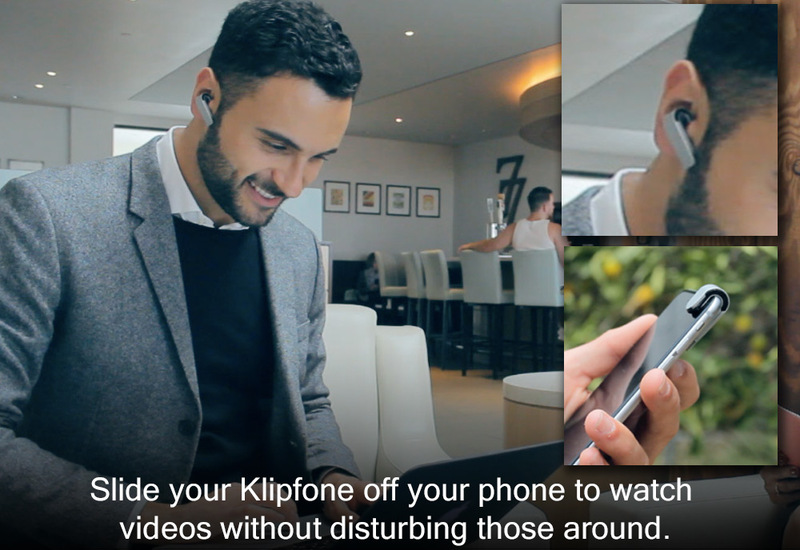 Introducing Klipfone – a stylishly shaped, ultra-thin wireless headset that clips on to your phone, where it stays ready for use. In an instant you can slide the headset off the phone and into your ear, and then back onto your phone when you’re finished using it. 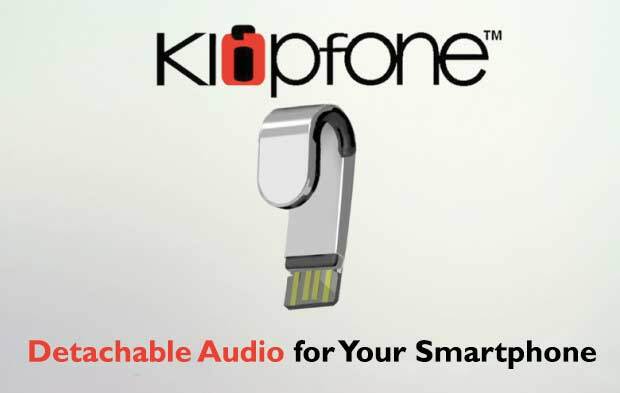 Klipfone will enable you to freely enjoy the abundance of videos and content on your phone like never before. 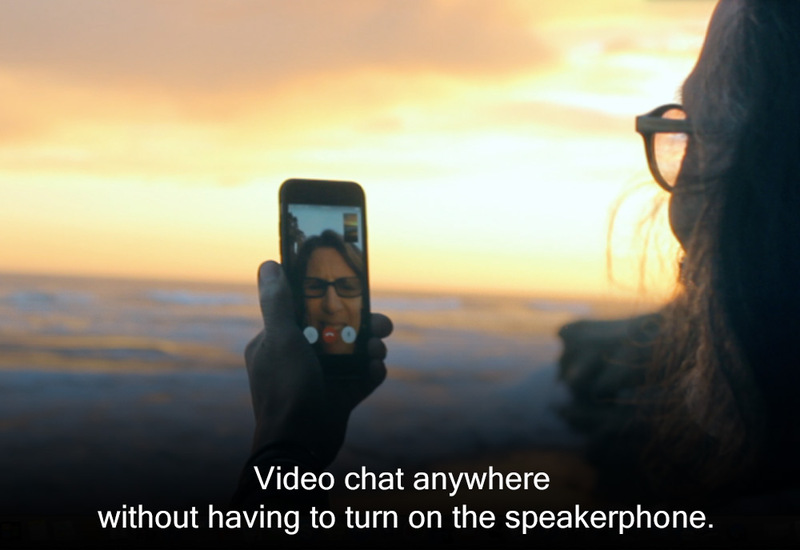 To enjoy videos and video calls without annoying those around you, you need to personalize the audio, but a headset or headphones are not always around, Unless you wear one all day. 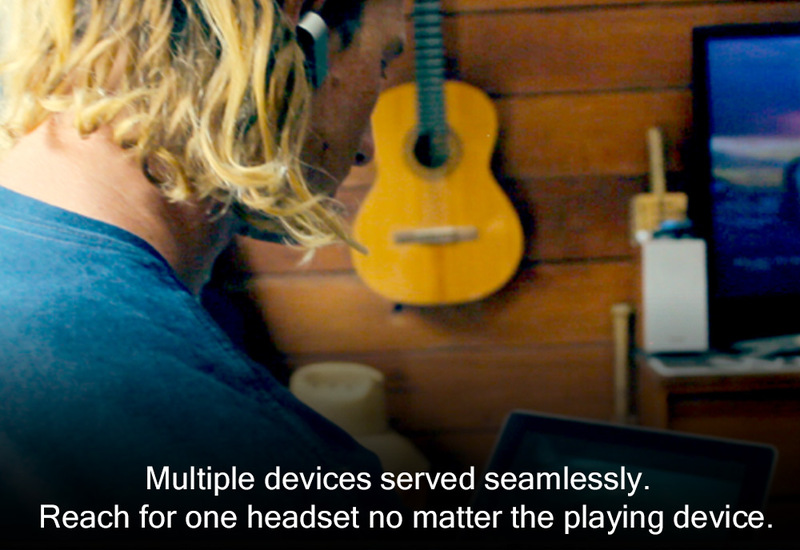 The Klipfone headset wireless audio headset technology is state of the art. 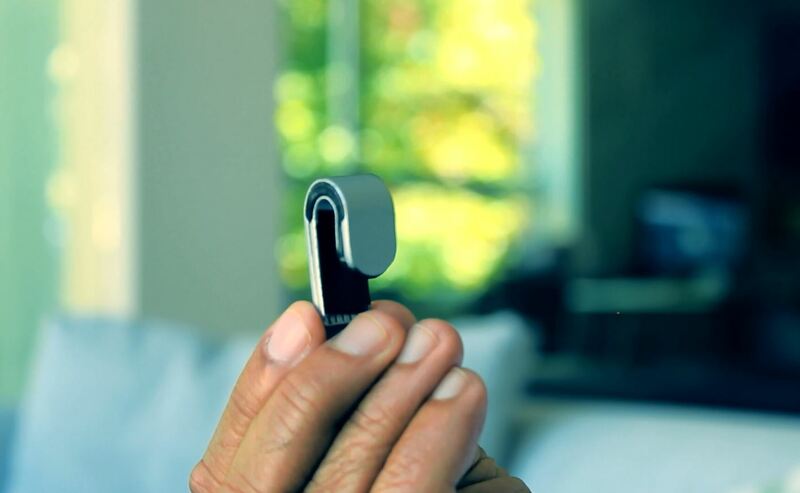 Packed in a U-shaped housing that stays clipped onto your smartphone, it is ready for use on a moments notice. 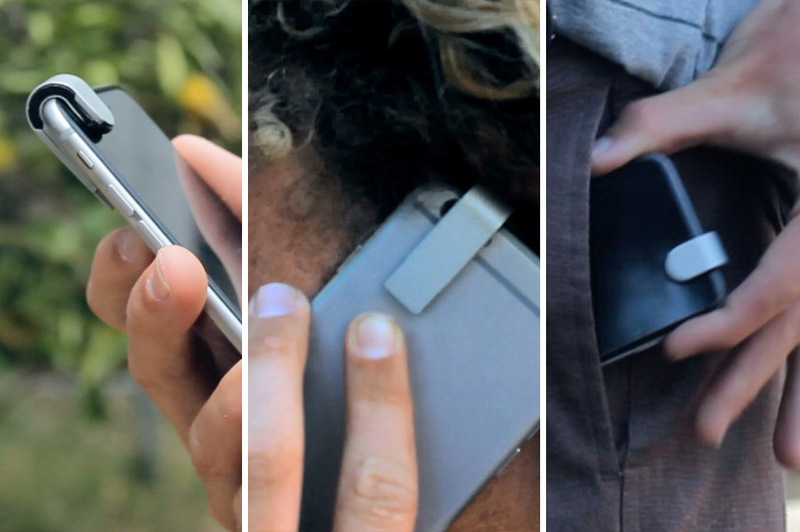 Just slide it off the phone and onto your ear when you need it. Slide it back on your phone when finished. is used or stowed away. To charge the Klipfone headset, simply plug it in a laptop’s USB socket, or the wall adapter. No cords to mess with. After two years of research into various form-factors, we have arrived at this flexible design, having smooth outside, and padded underside, keeping it secure on your phone and comfortable in your ear. 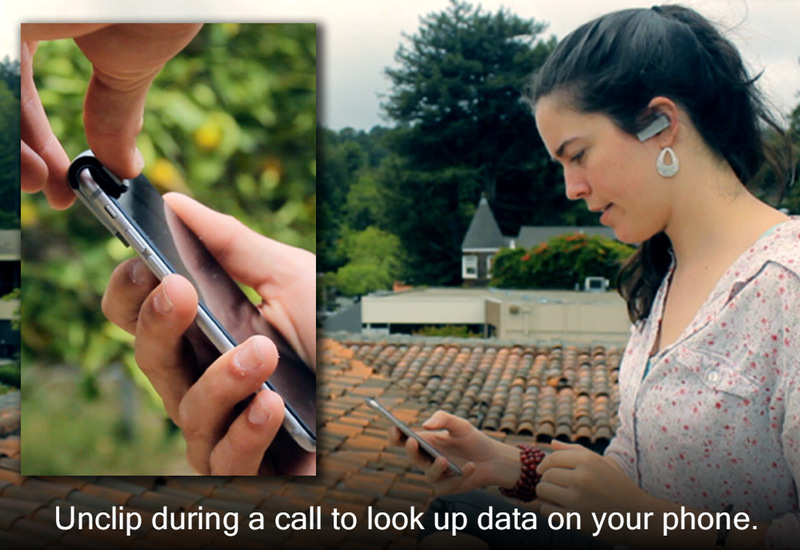 A Bluetooth headset, when not being worn by the user, clips onto the user’s smartphone, thereby it is always there when needed with the phone and one additional Bluetooth equipped device. 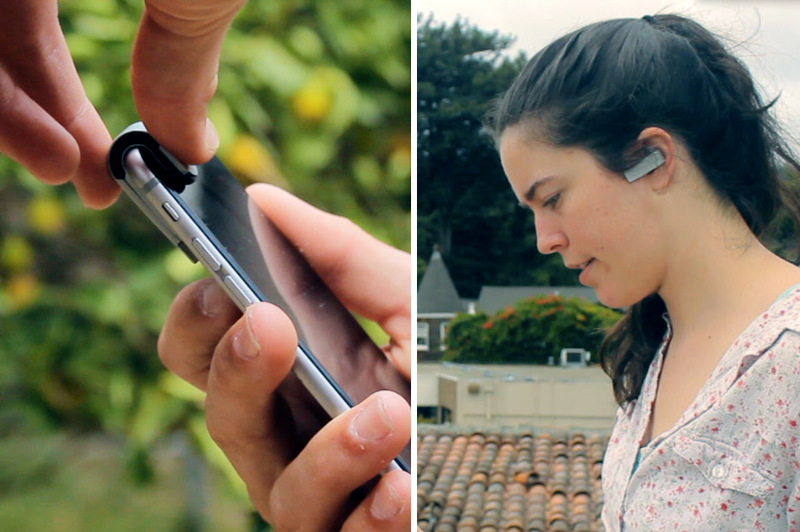 Shape: Concept headset clips securely on a phone and comfortably in an ear. Exterior: Smooth outside – secure on phone. Padded underside – comfortable in the ear. Size: 0.15” thick and 0.5” wide strip curves back to a 1.5” length. Weight: 3 oz. 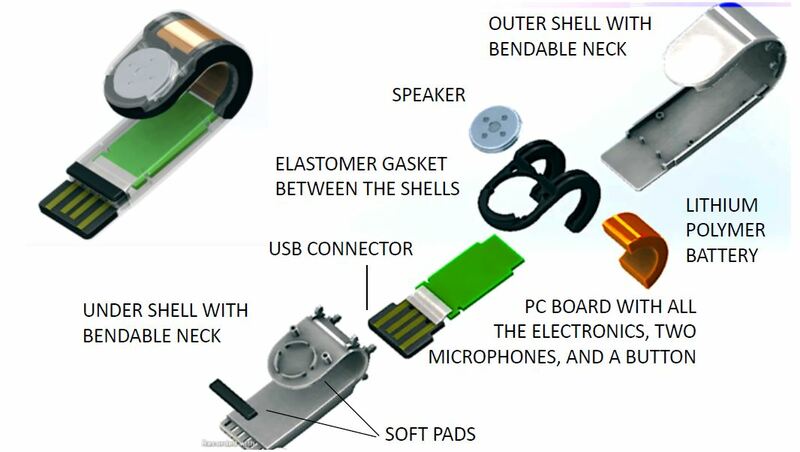 Fits: devices having 6 to 8 mm total thickness with or without case, such as iPhone 6, 7, and Plus models. Similar thickness Android devices. Processor: CSR chip set based. Wireless: Bluetooth version 4.1 with A2DP. NFC assisted auto pairing. Audio: Dual mic with noise reduction and audio enhancement. Power: 50 mAh Lithium Baaery. Charge in 2 hours. Talk 4 hours. Standby 160 hours. 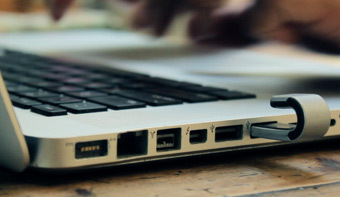 Built-in USB charger: directly plugs into a USB port of a laptop or adapter. Wall Adapter/Charger: with dual USB ports. THE KLIPFONE PRODUCT IS LICENSED UNDER US PATENTS US 6,952,617, US 7,149,543, CHINA PAT ENT Z L 0 0 8 0 1 9 5 9 . 2 , AND RELATED US AND INTERNATIONAL PENDING PATENTS.